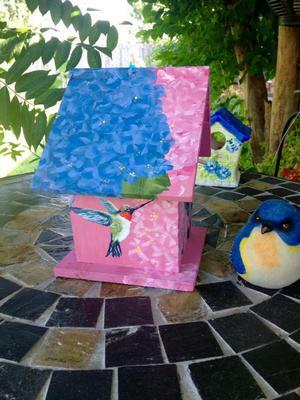 Just love my new hobby of hand painting birdhouses. This is one I made for my Grandma featuring her two favorite things - hummingbirds and hydrangeas. I use acrylic paints and free hand paint everything. Love to see everyone else's ideas on here as well! What a wonderful site! 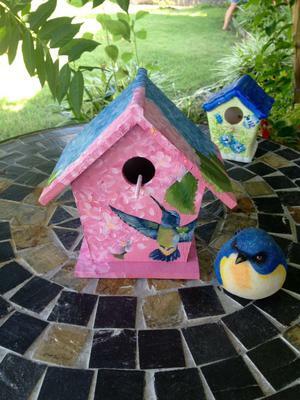 Lovely birdhouses. Thank you for sharing your talent. This is beautiful! I love the use of colors, the detail of the art, the passion that looks like went into this. What talent! 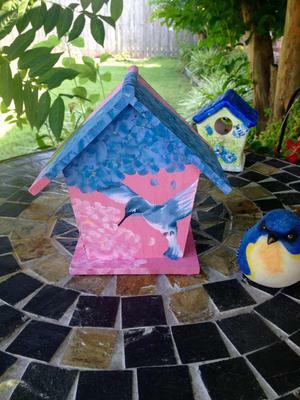 Love, love the hummingbird! Beautiful detail! Love the colors! Beautiful detail and design. Thank you for beautiful inspiration. Turning a hobby into works of art to be enjoyed by others. Very nice talented. That's so beautiful! Well done!